We currently have rates as low as 3.99% on selected units. O.A.C. Get between $300 – $500 towards travel expenses. Pedata RV is now offering EXTREME DISCOUNTS on all used RVs in inventory. #1 RV Sales in the USA! 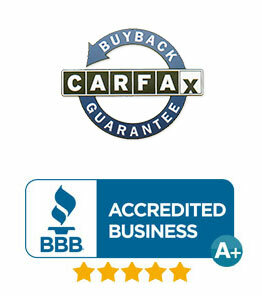 Best RV Dealers Near You or Buy Online and We Ship! Best Used RV for Sale. Including Class B, Class A, Class C Used RVs for Sale. Online RV sales from a #1 RV wholesaler & RV Dealers means you save thousands. Purchase motorhomes, travel trailers, and fifth wheels directly from America’s foremost recreational vehicle wholesaler and save as much as $10,000 or more. Enjoy the inherent ease of buying from a specialist in nationwide internet recreational vehicle sales. Our online RV sales on used RVs can’t be beat! Pay the lowest prices anywhere, whether online or on the lot. Pedata RV is the place to get the best price on used recreational vehicles. Feel relaxed and be comforted knowing that Pedata is not a high pressure recreational vehicle dealer. Our prices speak for themselves. Search our extensive online inventory of used RVs catered to every budget. That means GREAT RV sales deals for you! Select from a collection of Pedata’s hand-picked, quality used recreational vehicles from manufacturers, dealers, and private parties from all over the country. These high-quality recreational vehicles are online and searchable. Compare major brands of pre-owned recreational vehicles including: Holiday Rambler, Damon, Monaco, National, Newmar, Beaver, Winnebago, Fleetwood, Safari and many more. Pedata RV Sales Center, America’s foremost RV wholesaler, now sells used RVs, fifth wheels, and travel trailers direct to you! You can now purchase all major brands of pre-owned motorhomes like Holiday Rambler, Damon, Monaco, National, Newmar, Beaver, Winnebago, Fleetwood, Safari and more! Check out our online inventory for a variety of RVs catered to every budget. See all types of motorhomes from late model diesel pusher slide-outs to slightly older gas-powered non-slide-out coaches. You are sure to find the perfect recreational vehicle among Pedata’s collection of hand-picked, quality used recreational vehicles selected from dealers, manufacturers, and private party sellers all over the country you’re sure to find the perfect recreational vehicle for you. Also, don’t forget to contact our RV Experts if you are thinking “I need to sell my RV or I wonder what my RV is worth?” Pedata is committed to providing valuable recreational vehicle sales and maintenance that will guarantee that you become a lifetime customer! Pedata RV Sales is a locally owned, full-service recreational vehicle dealer offering recreational vehicle sales, maintenance, rentals, financing and extended warranties. 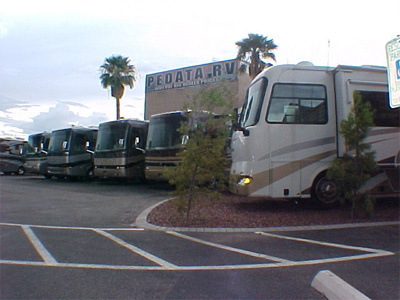 In addition, Pedata is conveniently located just 5 minutes from Tucson International Airport in Arizona, making its “fly and buy” recreational vehicle sales program a quick and easy way to purchase a wide selection of new and used diesel pushers and other recreational vehicles even if you are out-of-state (outside of Arizona). 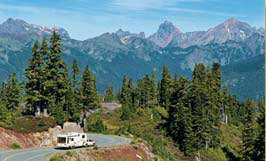 Pedata offers you many RV Rentals. We have new and used recreational vehicles: motorhomes, travel trailers, fifth wheels and toy haulers for weekly or monthly rental. You can rent a comfortable and convenient recreational vehicle for a couple of days, a couple of weeks, or more. Whether for business or pleasure, Pedata has a recreational vehicle rentals to meet whatever your needs may be. Pedata RV Sales has over 20 years of rv financing experience working for you and some of the best interest rates available. Whether you have perfect credit or less than perfect credit, Pedata will negotiate with every major recreational vehicle lender to find you the best possible rate and term on your recreational vehicle purchase. Even if you buy your recreational vehicle from another dealer, Pedata will carefully manage your rv financing and offer you the same valuable extended maintenance agreements offered to customers who buy their recreational vehicles at the Pedata dealership. For more information please check RV Financing.